Just over a week ago on ShukerNature (click here), I briefly mentioned how, several years ago, while browsing through some picture postcards at a local collectors fair, I chanced upon a vintage example depicting a dog acting as foster mother to three lion x tiger hybrid cubs. 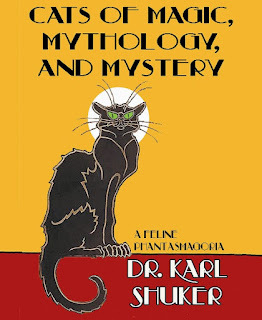 Never having seen this picture before, I swiftly purchased the postcard, and subsequently reproduced it in my book Cats of Magic, Mythology, and Mystery (2012) – which as far as I'm aware is the first time that this picture has ever appeared in any publication, certainly any dealing specifically with unusual cats. 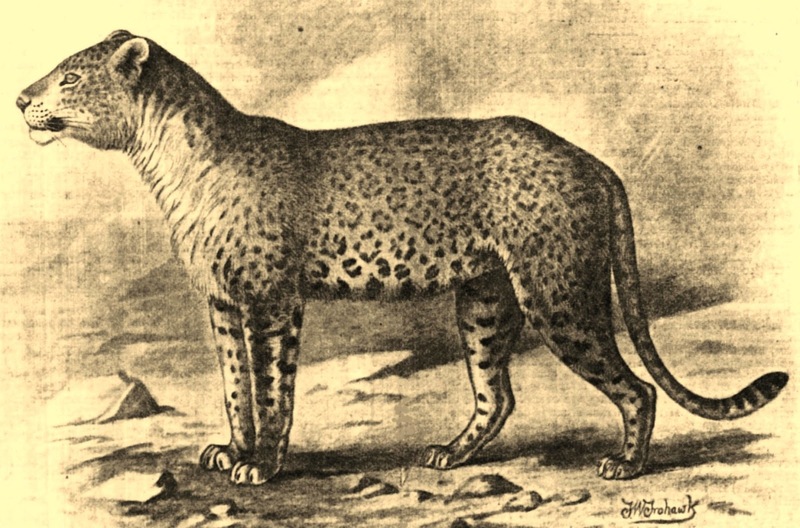 Since then, I've browsed online several times seeking other early illustrations of lion x tiger hybrids, to include in a planned future article, and have found some very interesting examples (adding to various ones already contained in my archives and included by me in my above-cited book). However, I have never once spotted my postcard's picture, not even when I have conducted specific Google Image Searches for it. Consequently, as a ShukerNature Picture History exclusive, I am presenting it herewith – seemingly the first time, therefore, that this fascinating image has ever appeared online too. In addition, its caption has served as a starting point for me to conduct some research into the history of this picture and its subjects, so here is what I've uncovered. 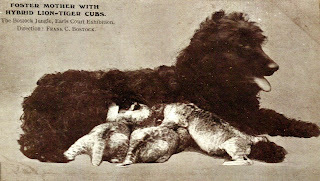 As seen here, this postcard's inset caption reads as follows: "FOSTER MOTHER WITH HYBRID LION-TIGER CUBS. The Bostock Jungle, Earls Court Exhibition. Direction: FRANK C. BOSTOCK.". But who was Frank C. Bostock, what was his Jungle, and when did it appear at Earl's Court? 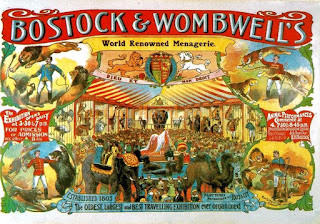 In fact, as zoological historians will be readily aware, the name Bostock is intimately associated with menageries and other animal-featuring exhibitions, including circuses, during the late 1800s and early 1900s, being a major part of a veritable menagerie dynasty. It all began in 1805, when George Wombwell (1777-1850) founded a menagerie in Soho, London, but which began touring Britain in 1810 as Wombwell's Travelling Menagerie, and subsequently traversed widely across the European continent, followed by North America (coast to coast), South Africa, India, the Orient, and even as far afield as Australia and New Zealand. During this time, it had continued to expand unabatedly, until at its height it was the largest of its kind in the world. By the late 1880s, this mega-menagerie was owned and run by one of Wombwell's great-nephews, Edward Henry Bostock (1858-1940), whose father James Bostock had in 1852 married Emma Wombwell, a much-loved niece of George Wombwell. Edward purchased it on 28 February 1889 from his mother Emma (who had received it earlier from her sister, a Mrs Edmonds, who in turn had inherited it from Wombwell upon his death). 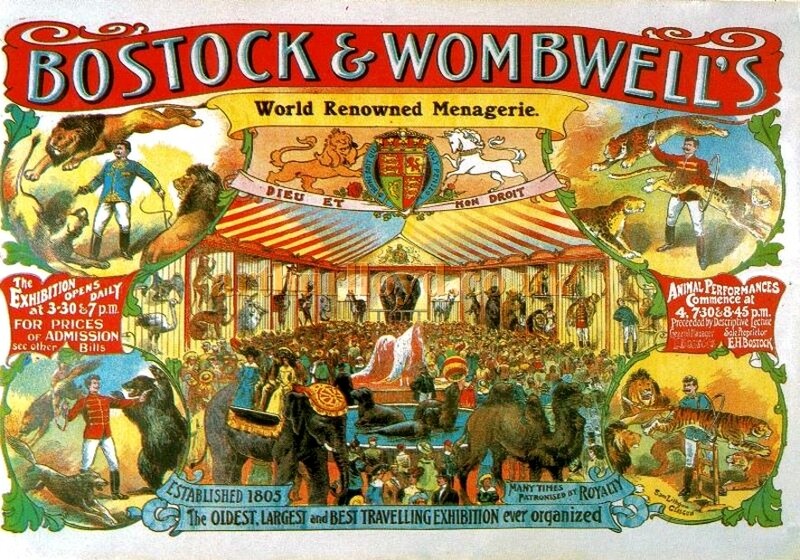 Edward had previously worked there until September 1883, and enhanced its already-considerable success by combining it with a circus, and renaming it Bostock and Wombwell's Menagerie (subsequently Bostock and Wombwell's Royal Menagerie). So popular did this enterprise prove to be that it continued to tour Britain until December 1931, when it staged its final show, at the Old Sheep Market in Newcastle, northern England. In 1932, Edward sold his animals to London Zoo at Whipsnade. Meanwhile, back in 1897 Edward built in Glasgow his very own Scottish Zoo, a non-touring attraction that was the first permanent zoo in Scotland, but which again incorporated a circus too, so it became known formally as the Zoo-Circus Building (and later the Zoo-Hippodrome Building). He also became a Fellow of the Zoological Society of London. Edward was always looking out for particularly unusual, exotic animals with which to draw in ever greater audiences to his zoo and touring menagerie, and, as I have documented in two earlier ShukerNature articles (click here and here), it was he who purchased in May 1908 the extraordinary three-species big cat hybrid Uneeka, a lijagupard (lion x jaguar-leopard hybrid), for display in Glasgow after she had been exhibited for a couple of weeks at London Zoo. 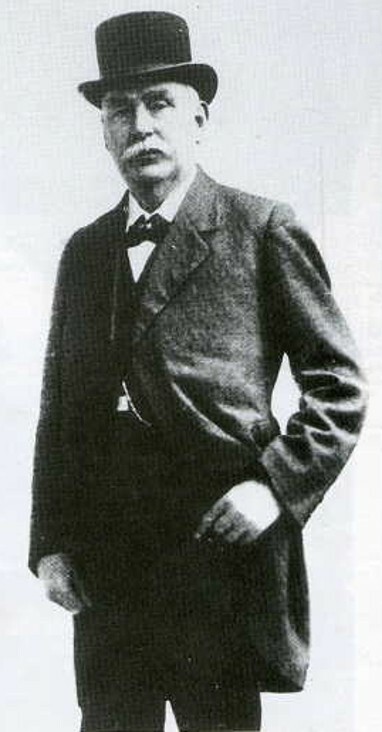 No less involved with menageries than Edward, however, was his younger brother, Frank Charles Bostock (1866-1912). 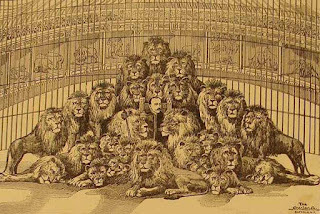 Edward utilised Glasgow as his primary base, but after running his own menagerie for a time in Britain before selling it to Edward, Frank then broke away by journeying to the USA in 1893 and establishing wild animal shows there instead, with partners Francis and Joseph Ferari, especially in New York at Coney Island's vast Dreamland amusement park until 1903, and becoming known as 'The Animal King'. During the opening decade of the 20th Century, Frank returned to Britain from New York as an extremely experienced menagerie keeper and exhibitor but also greatly skilled in the American 'big show' tradition of public entertainment. Accordingly, he deftly combined these two previously quite discrete elements to great success via the creation of a huge touring animal-themed exhibition officially known as Bostock's Arena and Jungle (but often shortened simply to Bostock's Jungle), which travelled from city to city and, in 1908, was staged at Earl's Court Exhibition Centre, London – during which the three lion x tiger hybrids featured in my vintage picture postcard were displayed. Big cat hybrids were very popular in such shows back then, due to their unusual nature and often very distinctive appearance. Tragically, however, the immense effort that Frank put into all of his shows and tours proved too much. In early October 1912, after having already become seriously ill with what was claimed by the media to be nervous exhaustion but which was apparently a stroke, he was found to have contracted influenza too, and passed away on 8 October, his 46th birthday, at his Kensington Mansions home in London. 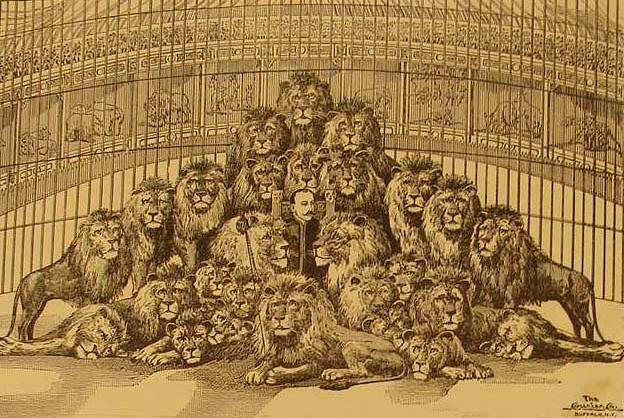 Unlike a number of other menagerie owners, Frank was famous and much-respected for the kind treatment that he always showed to his animals – a memorable quote attributed to him is: "Kindness is the whip used to lead dumb animals to obey" – and his funeral was attended by many hundreds of fans and fellow showmen, including the legendary circus owner Pat Collins. At the time of his death, Frank owned over 1000 animals, but I have yet to discover what happened to them afterwards – were they purchased, perhaps, by Edward, or sold off separately to other menageries, zoos, circuses, and/or private individuals? If anyone reading this article of mine has any information, I'd be most grateful to receive it and incorporate here, but credited fully to them by me as always. Finally: one of Frank's most celebrated animal stars, who brought him considerable fame and prestige, was a trained chimpanzee called Consul the Man Chimp – so-named because of his almost-human behaviour. Insured for what was then the enormous sum of £20,000 and dressed in the nattiest of human clothes (which he would put on and take off all by himself, mend if required, and even wash and put out to dry), Consul habitually walked upright, smoked cigarettes, drank wine and whisky as well as tea and hot chocolate, ate meals using a knife and fork, always travelled first-class, stayed only in the best hotels, and expertly drove his own electric car. Nor was Consul unique. 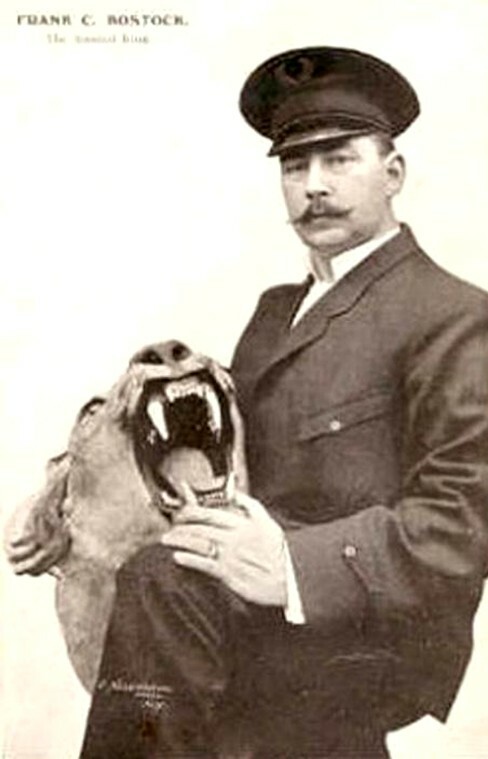 Following his death in 1904, he was replaced by a succession of new Consuls, some performing simultaneously at different shows run by Frank, who as already noted was an accomplished animal trainer. 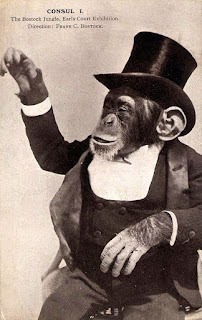 Reading about Consul and his successors, I am reminded irresistibly of another so-called 'man chimp' (aka a humanzee) – whose name was Oliver (read all about him here), and whose famously human demeanour now, in the light of those displayed by Frank's Consuls, seems a good deal less exceptional than traditionally deemed. 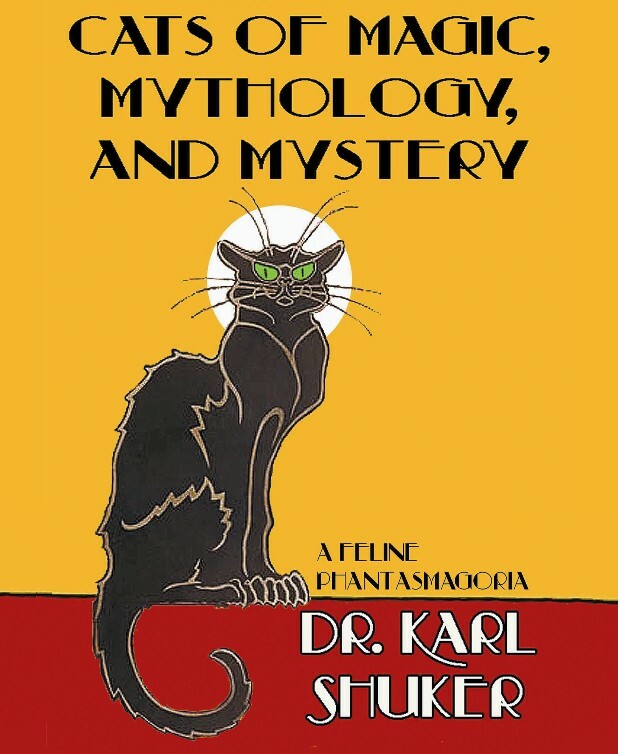 Before editing this book, I took the op­portunity offered by Mr. Frank C. Bostock of practically living in one of his animal exhibitions for a few weeks, in order to see things as they were, and not as I had always heard of them. I was allowed to go in and out at all times and all hours; to enter the training-schools whenever I liked; to go behind the runways and cages,—a special privilege given to the trainers only, as a rule,—and to be a spectator of whatever happened to be going on at the time. The thing which interested me most, and to which I paid special attention, was that at no time in this exhibition did I once see the slightest act of cruelty in any way. Each one of the trainers and keepers had pride in his own special animals, and I had many proofs of their kindness and consideration to their charges. The sick animals were most care­fully looked after and doctored, and in one case of a lion cub having convulsions, I noticed dim eyes in more than one keeper when the poor little animal was convulsed and racked with suffering. Had I seen the least cruelty or neglect in any way, I need scarcely say nothing would have induced me to edit this book. This was a great read. I especially like the part about Consul the Man Chimp. It's amazing at what some of these animals can do. Thanks for the share. In the Jardin des Plantes complex my favourite museum is the Museum of Comparative Anatomy. Consul’s skeleton is there. That was a surprise.